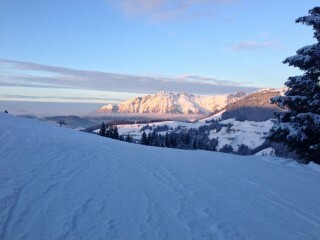 John Holdsworth, a ViewRanger user, has just returned from his skiing holiday in Switzerland. Below he talks about his experiences of EasyJet holidays and impromptu skiing opportunities! According to EasyJet the snow has arrived in the Alps. If like me you are a snow sport addict, then you probably can’t resist checking where they fly to and how long it would take to get those skis on to some fresh powder. A few years ago we flew EasyJet to Turin for an Easter break to take in some culture. We booked early to take advantage of a special deal and then realised just weeks before we flew that the ski season hadn’t yet closed and that Bardoneccia – home of the 2006 winter Olympics – was just 30 mins away on the train. We were on that train. If we did it again, I would definitely take ViewRanger on my phone and download the relevant mapping, so that we could see exactly where the ski slopes are in relation to the village. We made a guess that the apartment would be within walking distance of the ski run and were very fortunate that it was on the right bus route otherwise it would have been a long walk. Also, some of the pistes were designed more for locals than tourists so they didn’t have much signage and with everything closing around us we were a bit concerned about getting lost. With ViewRanger you can use GPS to see exactly where you are and to work out if it is down or uphill from the next lift, which is crucial information when you are tired. We had three glorious, unplanned days of skiing. On the last run of the day we enjoyed aquaplaning on the lower slopes, much to the disbelief of the locals – but what the hell, we are British and from Cambridgeshire – we don’t get to see snow on mountains very often! So if you are tempted to take a long weekend and enjoy some 'spur of the moment' skiing, EasyJet flies to some great places. Switzerland – best airports are Zurich or Geneva. The Swiss have a brilliant transport system that can take you seamlessly right up to the resorts. ViewRanger offers the entire Swiss Topo maps in a choice of scales so you can plan every detail of your trip. France – probably advisable to use the airport at Geneva and take the shuttle bus. From here you can get to The Three Valleys area of Meribel, Les Menuires and Courchevel, all less than 30 km. ViewRanger has IGN France mapping to download in three different scales. Italy – Turin airport is small and it is easy to catch a train up to the Italian Alps, such as Sestriere. Located in the Via Lattea area, which hosted the snow sports Olympic events in 2006, it boasts over 400 kilometres of runs and pistes. ViewRanger provides excellent mapping for the Italian Alps. 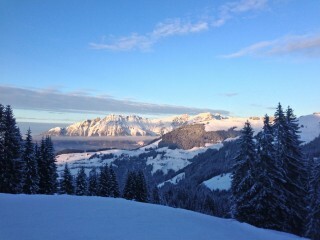 Italy is a personal favourite of mine for skiing, it is very friendly and everyone enjoys the food. One of the best meals we had was in a tiny bar eating pizza - served one at a time as they came out of the oven - with the regulars watching the local team win the football. Mapping is available to download to your phone via the ViewRanger app from SoluzionGIS, Litografia Artistica Cartografica and Kompass-Karten GmbH. Decide which you prefer here. Thanks to John for sharing his experiences of EasyJet and ViewRanger. 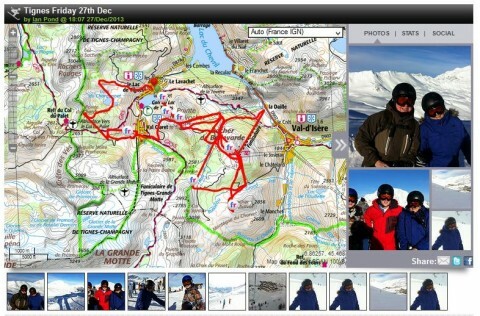 If you are planning a Winter Sports holiday we also recommend you track your route using ViewRanger, and geotag pictures to your route as you go. This creates a 'tripstory' which you can share with friends and family upon your return. So have a look at the EasyJet website, download some maps from ViewRanger and start planning.